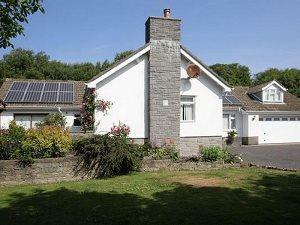 Bramwood is a self-catering Bungalow set in 1/4 acre of private landscaped gardens, on the Gower Peninsula in South Wales. The house is designed to meet the needs of a wheelchair user or anyone with limited mobility. We are unique on the Gower because we offer our Guests aand families access to an ArjoHuntleigh Maxi Sky 2 ceiling tracking hoist. As we are carers to our disabled son who is 32 we know what it is like to holiday without access to our equipment. it is an ideal base to visit Swansea or further afied Cardiff or towards Carmarthenshire. Bramwood is specifically designed to meet tthe needs of families and friends who wish to holiday together but with access to specialist disabled equipment. We can cater for children young adults and the elderly. We have a room covering X-Y celing tracking hoist in the accessible room and the ensuite. Children welcome from any age.